At the heart of what Del Monte Pacific does is the promise of health, wellness, superior value and innovation. The Group has launched a slew of new products using breakthrough technologies in ingredients, packaging and processes. Finding solutions to address emerging health issues has led to a host of innovative products that offer benefits, from promoting weight management and body fat reduction, to cholesterol lowering and bone health advantage. In the United States, we have a number of No-Sugar-Added packaged fruit products, and No-Salt-Added, and Reduced-Sodium packaged vegetable products. Frozen Fruit with Nice technology - In 2014, DMPL entered into a JV with leading Spanish fruit processor Nice Fruit SL and another partner to build a de-hydro freezing facility in the Philippines, and process, market and sell frozen fruits globally. It utilises Nice Fruit’s patented technology called Nice Frozen Dry (NFD) that allows fruits picked at optimal ripeness to be frozen for up to three years while preserving nutrients, structure, original properties and organoleptic characteristics. This technology has gained international acceptance, having won “Best Product of the Year” in the foodservice category at the prestigious Salon International de I’alimentation or SIAL in 2014, and FABI prize (Food and Beverage) for its revolutionary product from more than 2,000 companies at the National Restaurant Association or NRA Show in Chicago in 2015. This technology foresees radical changes in food consumption habits, and advantages for export and improved stock management. The facility in Bukidnon, southern Philippines, adjacent to DMPL's pineapple plantation, started commercial operations in May 2017. 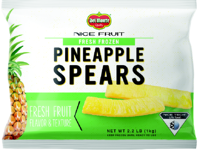 In June 2018, individually packaged frozen pineapple spears or "Pineapple Stick" started selling in 7-Eleven Japan, positioned as an on-the-go healthy snack in the store's chiller section. Del Monte Fruit & Oats are the first ready-to-eat oatmeal with one full serving of fruit plus 20 grams of whole grains. Our Fruit & Oats snack cups are a great new way to start your day and are delicious hot or cold. It is available in three great-tasting flavours – Apple Cinnamon, Peach Cinnamon Spice and Pear Maple. Available in USA. Del Monte Fruit & Chia are a category first combining luscious fruit with chia seeds for a cup full of flavour, fibre and 800 mg of omega-3s. It is available in four refreshing flavours - Peaches in Strawberry Dragon Fruit Flavoured Chia, Mixed Fruit in Tropical Flavoured Chia, Mangos in Pineapple Flavoured Chia and Pears in Blackberry Flavoured Chia. Available in USA under the Del Monte brand, and in Singapore and Hong Kong under the S&W brand. Del Monte Fruit Refreshers are the first-ever adult fruit cup which comes in a larger 8oz size. It is available in four unexpected flavours and exciting combinations - Pineapple in Passion Fruit Water, Mandarin Oranges in Coconut Water, Grapefruit & Oranges in Pomegranate Fruit Water and Grapefruit in Pink Guava Fruit Water. Del Monte Fruit RefreshersTM won Product of the Year in the Healthy Snacking category based on TNS consumer survey of product innovation by 40,000 consumers in the USA. Available in USA. Del Monte Dried Fruit - Riding on the growing consumer trend for healthier snacking alternatives amongst young working adults, Del Monte was one of the first to introduce a range of packaged dried fruits in India - Blueberries, Cranberries and Prunes - that gave consumers the benefit of a low-fat, low-sodium, high-fibre snack. Available in India. Del Monte Canned Vegetables with Sea Salt - Our canned vegetable products only use Natural Sea Salt raising both the taste and health benefits! Available in USA. Del Monte 100% Pineapple Juice Bone SmartTM is a calcium-fortified pineapple juice that contains twice the level of calcium found in a glass of milk. It is designed to provide the same benefit to lactose-intolerant consumers, pregnant women or anyone who wants stronger bones. Available in the Philippines. Del Monte 100% Pineapple Juice Heart SmartTM is the goodness of 100% pineapple juice enhanced with the breakthrough formula of ReducolTM, a natural combination of plant stanols and sterols, clinically proven to lower Low Density Lipoprotein (LDL) or "bad" cholesterol. ReducolTM plant sterol blend has undergone clinical trials and has been shown to lower LDL cholesterol levels safely and naturally. Del Monte 100% Pineapple Juice Heart Smart is the heart smart way to keep your cholesterol worries away. Available in the Philippines. Del Monte Fit ‘n Right Juice Drink is the first drink in the Philippines to contain Green Coffee Extract and L-Carnitine proven to result in body fat reduction with diet and exercise. L-Carnitine is a naturally occurring amino acid found in our human bodies, mostly in the body's muscle tissue. It plays an important role in the metabolism of fat. It attaches to fatty acids and transports these to the mitochondria in all cells. The mitochondria then converts fat into energy. Instead of depleting glycogen, an important energy source, L-Carnitine allows the body to use fat instead for energy production, thus reducing body fat. L-carnitine is available in red meat and dairy products in high concentrations. It is also found in nuts and seeds, fruits and vegetables, legumes and cereals. L-Carnitine is also widely available as supplements. 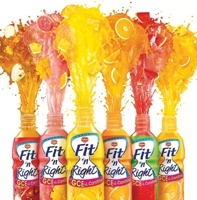 Del Monte Fit ‘n Right Juice Drinks are available in the Philippines. Del Monte Fit ‘n Right Active is the first and only 2-in-1 Isotonic Drink in the Philippines with Electrolytes to rehydrate and L-Carnitine to help you reduce fat. It comes in two refreshing flavours - Blueberry Grape and Mixed Berries. Get more from your workout with the new Fit ‘n Right Active! Available in the Philippines. Del Monte Fiber-Enriched 100% Pure Pineapple Juice not only contains Phytochemicals, which are good for the body, but is also enriched with 16% of US RDA for fiber to help sweep away unwanted toxins and maintain a healthy digestive system. With the toxins elimination, fiber actually helps reduce the risk of certain cancers like colon cancer. It also helps prevent constipation. Drink Del Monte Fiber-Enriched 100% Pure Pineapple Juice everyday for a healthier digestive system. Available in the Philippines. Del Monte 100% Pineapple Juice with Immune-Builders Vitamins A, C & E is 100% Pineapple Juice made even more nutritious with the added benefits of powerful anti-oxidants Vitamins A, C & E. Vitamin ACE is the anti-oxidant team, which helps slow down signs of ageing and builds body resistance against diseases. It helps keep bodies stronger and ready to face the daily harmful effects of dirt, pollution, infection, changing weather, and exposure to sickness. Available in the Philippines. Del Monte Fizzy Juice Drink is a healthier alternative to soft drinks. It is made with real fruit juice, with no added sugar and is fortified with 100% of daily Vitamin C needs. Plus, it’s caffeine and calorie free! Enjoy this healthier fizz in two deliciously and refreshingly fruity flavours: Pineapple and Orange-Pomelo. Available in the Philippines. S&W Organic Prune Juice changed the game in the prune juice segment in terms of product positioning where S&W rode on the consumers’ trend for organic and holistic food and beverage. Available in Singapore. 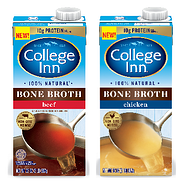 College Inn Bone Broth is slow simmered and carefully crafted from premium quality meat and bones, farm-grown vegetables and our unique blend of seasonings, providing a richer depth of flavour plus 10 grams of protein per serving. It comes in beef and chicken flavours. Available in USA. Del Monte Creamy & Cheesy Spaghetti Sauce is our creamiest and cheesiest ever! This red sauce is made from Lycopene-rich and naturally sweet California tomatoes, now made even more delicious with added real cream and cheddar cheese. Spaghetti dishes are much easier to make! Available in the Philippines. Del Monte Extra Rich Banana Ketchup is made only with fresh, locally-grown bananas so it has a noticeably fresh and real banana taste captured within a deliciously sweet and zesty sauce. Available in the Philippines. Del Monte Quick ‘n Easy with No MSG is a range of cooking aids which includes recipe sauces, pizza sauces, mixes and marinades, with the tomato-based sauces having the added benefit of lycopene, and there is no MSG! Del Monte Quick ‘n Easy is a great companion for novice cooks in whipping up easy-to-prepare everyday dishes. Available in the Philippines. 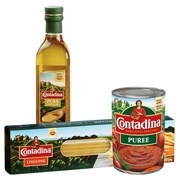 Contadina takes to heart the Mediterranean philosophy of cooking with passion, using only the finest ingredients to deliver rich and authentic flavours. Grown and hand-picked from the most fertile regions of the world, our premium quality products boast flavours worth savouring. It's our passion delivered straight to your plate. Our Olive Oil comes from Andalucia Spain. Our Pasta is made from 100% Durum Wheat Semolina from Canada, while our Pasta Sauces are from Italy and Canned Tomatoes from California. Available in the Philippines. College Inn No Salt Added and No MSG -To make cooking healthier, Del Monte introduced two new “No Salt Added” cooking stock products to its College Inn® line of broths and stocks. 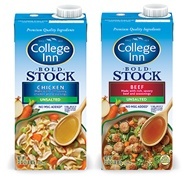 The entire College Inn® stock lineup now has “clean labels” and no added MSG. 17 other College Inn® broth products are now allergen-free and free of partially hydrogenated oils (PHO) to appeal to a wider audience of creative cooks who are seeking out healthier options in their meals. Available in USA. Del Monte Dips and Spreads. We offer a wide range of dips and spreads that are customised to suit the Indian palette and are great to pair with snacks. Eggless Mayo, Egg Mayo, Mint Mayo, Tandoori Mayo, Cheesy Garlic Mayo, Sandwich Spread, Cheesy Dip and Tartare Dip - there is something for everyone! Available in India. 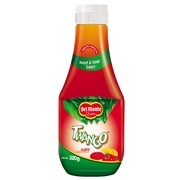 Del Monte Twango is a sweet & sour sauce with real bell-pepper bits and pineapple pulp, perfect for adding that tangy, fruity essence to your food! Available in India. S&W Pineapple Slices and Chunks in clear can breakthrough package. Clear cans are see-through plastic containers with metal lids, which allow consumers to see the product and be assured of its premium quality. This product won the International Innovation Award from Enterprise Asia. Available in South Korea. Del Monte Fruits in glass jar, plastic jar and cup - Our delicious and nutritious fruits also come in glass jars, plastic jars and cups with spork. Available in USA. 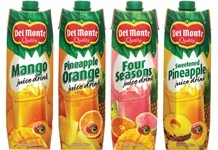 Del Monte Juice Drinks in carton packaging - We have expanded our juice drinks from single-serve cans to a multi-use, more affordable 1-Litre carton packaging. Available in the Philippines and in USA. Del Monte Tomato Ketchup in a resealable pouch is our well-loved Ketchup in a convenient stand-up-pouch format with a reclosable spout. Available in the Philippines and in India. Del Monte Pineapple Tidbits in pouch - From a recent study, it was established that consumption of a small can of Del Monte Pineapple Tidbits a day increased the production of granulocytes, which make up 60% of the body’s white blood cells, known as the body’s first line of defence against infection. In order to make the product more accessible everyday for consumers, a low-cash outlay pack format was developed. Del Monte Pineapple Tidbits was introduced in a stand-up pouch (SUP) format, the first in the market to offer an affordable format that encourages increased consumption, not only for enjoyment but also for better immunity. Available in the Philippines. BPA-NI cans - In the United States, Del Monte has been an innovation leader in working with our packaging suppliers to develop, qualify through rigorous testing, and commercially implement BPA-NI (BPA Non Intent) packaging. These programmes now permit 100% of Del Monte® fruit and tomato products, and nearly all of Del Monte® vegetable products, to be packaged in containers that do not use BPA in the packaging production. This packaging innovation helps assure that Del Monte is a trusted source of high-quality food products and satisfies evolving regulatory requirements.